Alfred Matthew Weird Al Yankovic is an American singer-songwriter, music producer, accordionist, actor, comedian, writer, satirist, and parodist. Yankovic is known for his humorous songs that make light of popular culture and that often parody specific songs by contemporary musical acts. Yankovic's first top ten Billboard album and single were both released in 2006, nearly three decades into his career. Yankovic's success comes in part from his effective use of music video to further parody popular culture, the song's original artist, and the original music videos themselves, scene-for-scene in some cases. He directed later videos himself and went on to direct for other artists including Ben Folds, Hanson, Black Crowes, and The Presidents of the United States of America. 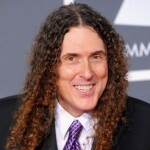 In addition to recording his albums, Yankovic wrote and starred in the film, UHF, and television show, The Weird Al Show. He has also made guest appearances on many television shows, in addition to starring in Al TV specials on MTV.